Kirstin: I cooked this all afternoon. First on the hob and then in the oven for a few hours. I was even able to play some football with Miles while it roasted away. Tom: I always say the longer you cook bolognaise the better it tastes. 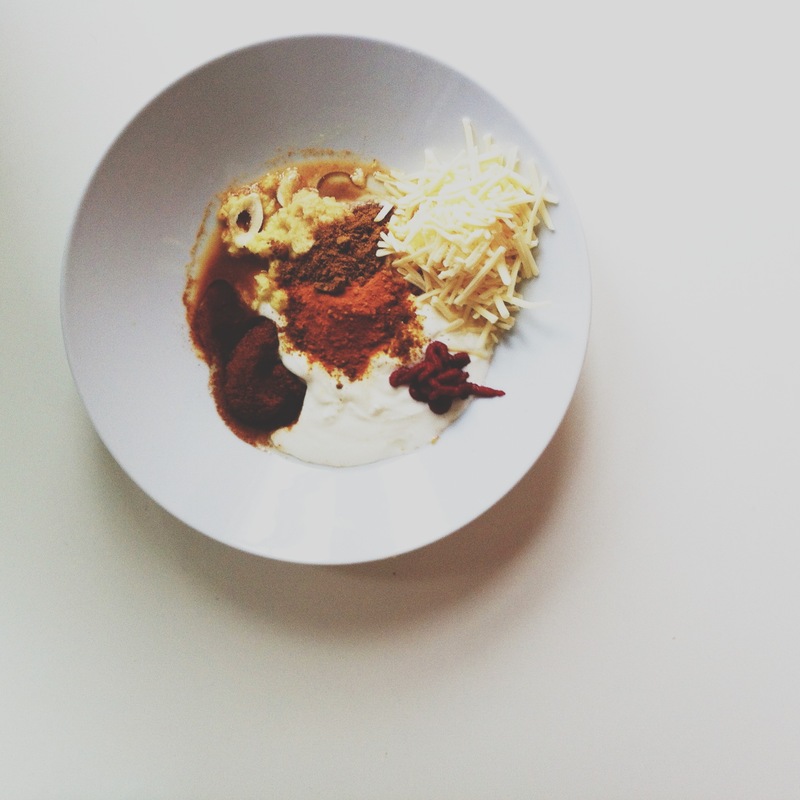 Kirstin: I loved the way the spices looked as I prepared them for the marinade. Tom: And I love all the crunchy bits. Look, even the children are eating it! Peter: What are we having tonight then? 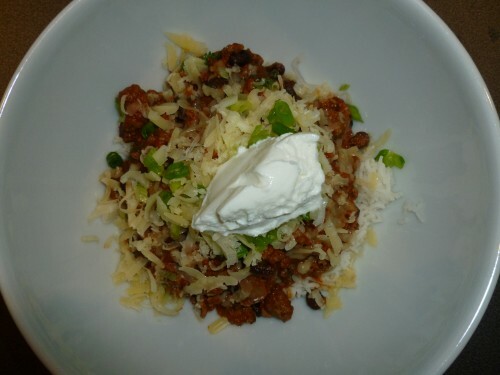 Anna: Smoking chilli con carne. Peter: Smoking? What makes it ‘smoking’? Anna: Glad you ask. I had to griddle the chillis first before making the sauce. To give them a smokiness. Peter: Can’t you just use smokey chillis instead? Anna: Good question. I do use chipotles in my usual ‘posh’ chilli. 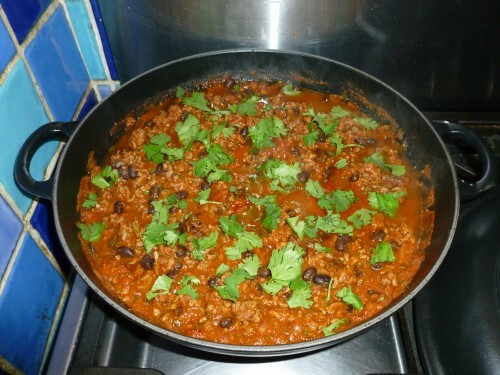 That is, the chilli I do on weekends or special occasions, rather than my fail-safe, quick and dirty weeknight chilli. Peter: This is drier than your usual weeknight chilli. Anna: You mean less sauce? Is that a good thing? Peter: Yes. This tastes professional. 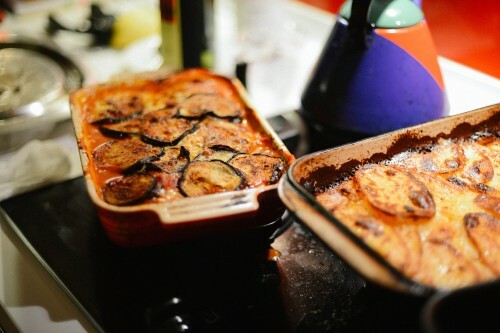 Anna: That might be because I had to strain the sauce through a sieve. Not something I would normally do, and I have to admit to being rather suspicious of this step in the recipe. But I think it worked. Peter: I think I prefer this chilli to our usual one, but maybe that’s becuase I wasn’t cooking it. It didn’t seem so bean-heavy either and I liked the addition of the fresh coriander. Anna: I think this is a keeper then. A rare day off. A lunch for one. I marinated the tomatoes in a lime, coriander and honey dressing. 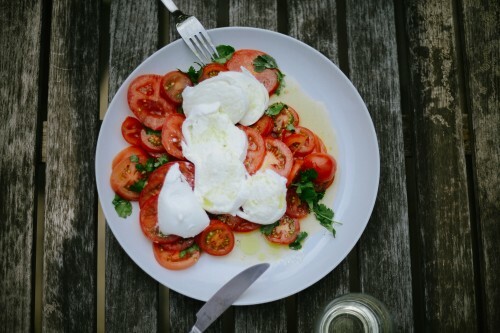 The tomatoes were so very tasty and the mozzarella, a perfect foil. I will be making this salad all summer, mark my words! 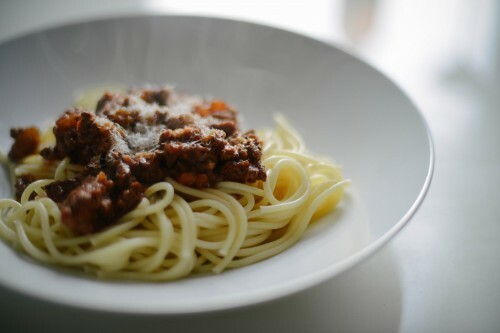 Anna: Mr Stern offers 3 options for this recipe. I chose the one with smoked salmon and bacon as it sounded delicious. Peter: Cold lentils could taste a lot worse than this. Anna: Lentils are served cold all the time! Peter: I haven’t had them before. But these are good. Anna: Puy lentils. You’ve got to love them. 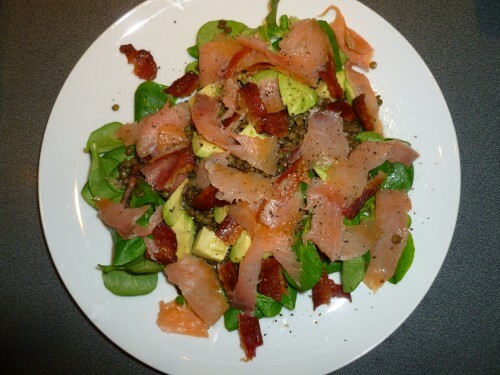 Peter: I wouldn’t have thought about having bacon and smoked salmon together. Anna: Did it make it too salty for you? Peter: No, I like it salty. I could have eaten a bit more… being a salad it’s virtually calorie free surely? Anna: Well I did up the quantities of salmon and bacon slightly otherwise you may have thought we were just having a starter for dinner. Unfortunately both bacon and smoked salmon aren’t well-known for their low-calorie properties. But it is a carb-free salad. And pretty filling I have to say. I think you would like the version with chipolatas. Peter: Clearly this is a flexible salad. I like the sound of chipolatas. Anna: So you would like me to do this again? Peter: I wouldn’t say no. Tom: Wow. I love it when lamb goes all gooey and burnt on the outside like this. Just the way I like it! What did you have to do it? Kirstin: Apart from cook it for four hours? I had to stuff it with all sorts of goodies. Tom: But what goes on the outside? Andrew (12): That chicken is some good eating! Tim: I would definitely want to have this again. Nicholas (9): I would want to have it again, but not with the coleslaw. Just with carrots. 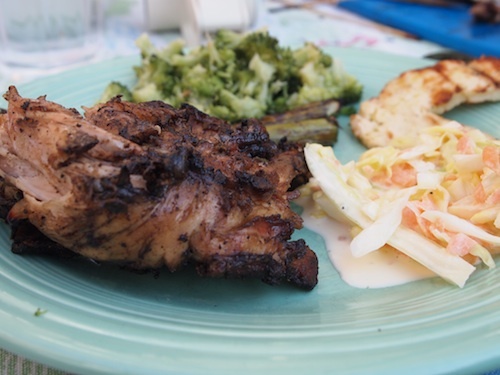 Maureen: You guys need to go to more American picnics, where coleslaw is considered its own food group in the summer. It’s all delicious. Tim: This is a plate full of yum. The grilled vegetables are also really good too. Maureen: Yes, but we’re not talking about those. I can’t stop eating this chicken, it’s so good.